One of the true delights of the steamy summer season in Maryland is the return of the Monarch butterfly. I saw my first female monarch several weeks ago sipping nectar from a swamp-milkweed. Last autumn the great-great-grandparents of this beauty survived a dangerous and arduous migration from the eastern United States to their overwintering sites in central Mexico. During the long winter they bested predators and weather in their highland retreats. This spring, the vagabonds flew hundreds of miles from Mexico to the southern United States before finding suitable milkweed plants to serve as food for their young. The female monarch lays her eggs, usually one per plant, on the undersurface of a leaf. 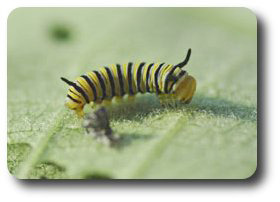 After several days the egg hatches and the tiny monarch caterpillar, boldly banded with yellow, black, and white stripes, begins to consume the nutritious leaves. From the milky sap of the milkweed the larva obtains potent defensive chemicals known as cardiac glycosides. These compounds are stored in the caterpillar’s body and passed along to the adult butterfly. Birds are important predators of many kinds of butterflies, including monarchs. The cardiac glycosides found in the monarch caterpillars and adult butterflies cause would-be predators, such as blue jays, to vomit. The conspicuous orange and black coloration of the adult monarch serves as a warning to the enlightened bird that eating this attractive morsel will have nasty side effects, including an upset stomach. The caterpillar grows and sheds its skin several times before becoming a pupa. Just before the transformation to the pupal stage, the caterpillar suspends itself with silk from a leaf or stem and assumes the shape of a “J”. The last larval skin splits open to reveal the pupa, also called the chrysalis. In about a week, the monarch butterfly emerges from the chrysalis and begins the tasks of finding nectar to eat and a worthy mate to carry on the royal lineage. Monarchs continue their annual march northward to feeding grounds in the northern United States and southern Canada, producing another couple of generations of butterflies as they go. Triggered by falling temperatures and shorter days that signal the approach of winter, the final generation of monarchs undertakes one of the most heroic adventures of any living creature. Monarchs from the central and eastern US head for the mountainous forests of Michoacán, Mexico, a trip that may exceed 2,000 miles. Monarchs in western North America make a similar journey from southern Canada and the northern US, but instead of heading for Mexico, they veer south and west to the coast of California. Here among the boughs of eucalyptus and Monterey Pine, they find refuge from freezing temperatures, a habitat that offers high humidity with morning fog, and shelter from the wind. On chilly days and at night, monarchs huddle in large clusters and conserve body heat. On warm days when temperatures exceed 55 degrees Fahrenheit, monarchs fly in search of nectar to replenish energy reserves. In addition to providing a convenient roost, some eucalyptus trees bloom during the monarch’s annual visit to California and provide food. Many predators, including several species of birds, take advantage of the bounty of so many insects in one place. At overwintering sites in Mexico, black-backed orioles and black-headed grosbeaks kill millions of monarchs each year. Clever birds such as jays learn to avoid more poisonous parts of the monarch’s anatomy like the wings and dine on less offensive parts like the thorax. In late winter, with moderating temperatures and increasing day length, monarchs become reproductively active. They mate, leave the refuge, and begin a journey that takes several generations and many months to complete as they follow milkweed to the northern limit of its range. In the chrysalis, the caterpillar transforms into a butterfly. In December of 2009, I visited the Monarch Sanctuary in Pacific Grove, California, also called “Butterfly Town,” with high expectations to witness thousands of monarchs hanging from trees and shrubs. A friendly and helpful resident of the town directed me to several locations where monarchs had been spotted in years past, but luck escaped me and not a single cluster of butterflies was seen. The monarchs apparently decided to spend that day, or perhaps the season, in a more hospitable location. My acquaintance offered that the monarchs had been scarce in recent winters. Too many visitors, declining health of the trees, and other problems related to urban sprawl might contribute to the local decline of monarchs in Butterfly Town. “Perhaps, the monarchs are in Santa Cruz or Saint Luis Obispo,” she said. The good news here is that monarchs have returned to Pacific Grove in ever increasing numbers over the past several years and in November of 2011 more than 12,000 monarchs were seen in their overwintering roosts. Let’s hope this is a healthy sign for one of the most fascinating wanderers of the insect world. It's a wonder any milkweeds survive the feasting season of monarch caterpillars. Bug of the Week thanks an unknown resident of Pacific Grove for providing the inspiration for this episode. Two excellent references, “The Butterflies of North America” by James Scott and “Foraging Dynamics of Bird Predators on Overwintering Monarch Butterflies in Mexico” by Lincoln Brower and William Calvert, were consulted for this story.